Metro Wardrive is by no means epic. It doesn't have boss fights or an original control scheme. Plus, no trace of a preprogrammed enemy AI is to be found anywhere in the game. So what makes this tabula rasa shooter worth your time? It's definitely not the graphics, consisting only of simple three dimensional polygons and a plain black background during play. Nor is it the gameplay, which is reminiscent of something you'd drunkenly play for hours at an 80's arcade. If you're looking for a storyline, Wardrive's is 100% nonexistent. To be blunt, the game seems to actively discourage immersion with your handheld. But if approaching Metro Wardrive with an open mind, these complaints cease to be complaints at all. Ironically, they begin to make perfect sense as necessary design choices. And although what I've been describing so far doesn't seem like a far cry from a bad Asteroids Remix found in bargain Playstation collections, Metro Wardrive's emptiness is not only the game's foundation, it's also precisely what'll compel you to check out rene bauer, beat suter and mirjam weder's website to download the game. Their Switzerland-based collective, known as "and-or," work on a wide array of experimental projects, not all of which are directly applicable to gaming. And-or labels Metro Wardrive as proof of concept, a barebones model which is meant to demonstrate potential and that's exactly what their project does. And although attempts at Wardriving on the DS like DS2Key have been successfully produced by other homebrewers, none have used the capability as a primary gaming element. By introducing the widely unknown hobby of detecting and mapping local wifi hotspots to gaming Metro Wardrive reveals the previously untapped space for the seemingly unnatural permutation in an incredibly ambitious, radical way. As mentioned, levels do not contain preset content. On the contrary, Metro Wardrive's environment is constantly evolving around your physical location. Enemies are generated directly from local wifi hotspots, hence the "Wardrive". What this translates to is a very different set-up from one game to the other. Because the game analyzes wireless streams in real time, much of the content is created dynamically according to minor changes in the connection or readings. One major implication to mechanic is the need for a good range of wireless signals. If you have no hotspots around, generating enemies will become more than a minor inconvenience to say the least. Furthermore, if you're being physically barraged by a mass of wifi points, the corresponding gang of incoming enemies will tear your sole defensive point - a crystal - completely apart. Metro Wardrive attempts to work around this problem by offering a variety of modes based on your wifi situation. Speed options range from riding on a metro to sitting in a stationary position, with more particular ones in between the two also available. When physically traveling faster, the game expects you encounter more hotspots, lowering the spawn rate appropriately; the opposite being true for slow movement. Given the proof of concept, what prospects exist for the concept's realization? Wardriving may very well be a passing fad like Pogs (and I still have my favorite Popeye slammer), with a mere following among a handful of programming students and tech heads. And despite its technology being freely available to any portable device with wireless function including your PSP and cell phone, Wardriving will not be an easy sell. But that won't ultimately determine whether the genre is to catch on with plane, train, and automobile passengers. Rather, it's the question of wireless signals' general reliability. Hotspot-based AI doesn't fit well into a world filled with mapped-out scenarios or planned in-game events. Instead, a Wardrive game's design requires the central mechanic to be based around some kind of interaction between player and their wireless environment. Trying to successfully program anything other than a simple shooter doesn't sound like any easy task. Fortunately, there are some encouraging signs for Wardriving given recent trends from a combination of sources from both in and outside the gaming industry. By promoting projects which integrate the DS wifi connection to local environments, Nintendo has been signaling that wifi-based interactivity is plausible for the handheld medium. This is demonstrated by Nintendo's agreements with art centers to incorporate the DS into physical tours. 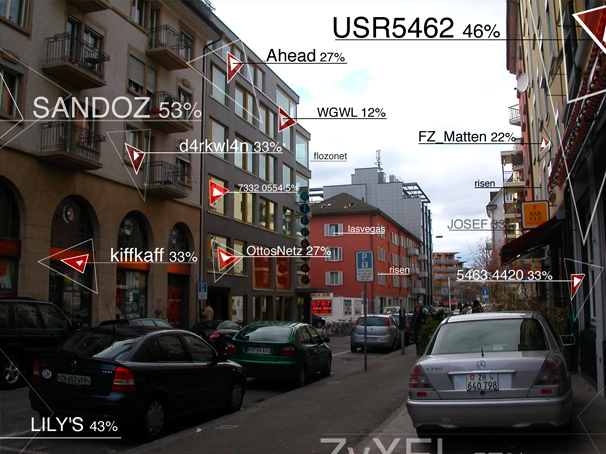 By tracking position via hotspots, the "gaming device" pings back information about the user's immediate area. On the homebrew front programmers are continually experimenting with different Wardriving-like techniques, including feeding hotspot data back in music form (see: sniff_jazzbox by the people behind Metro Wardrive). Moreover, the use of Wardriving technology is not restricted to portable gaming as we know it. Broader application, like the Nintendo model, can have a profound impact on spheres of gaming that go largely ignored by video game consumers. The ability to have instant knowledge about your local wireless area can be a massive boon to viral gaming. Marketers who promote interactive games that rely on solving physical puzzles with hints transmitted through the internet would undoubtedly jump at the idea of using handheld tracking systems to enhance the experience. A matter of time will tell what happens to handheld Wardriving and and-or's input may well be completely forgotten. The magic bullet prototype confidently proving that hotspot-based video games are totally plausible is also unlikely to come along anytime soon. This is why it's important for those of us who do happen to come across impressive proof of concepts like Metro Wardrive to show support for innovation where it's otherwise largely lacking. 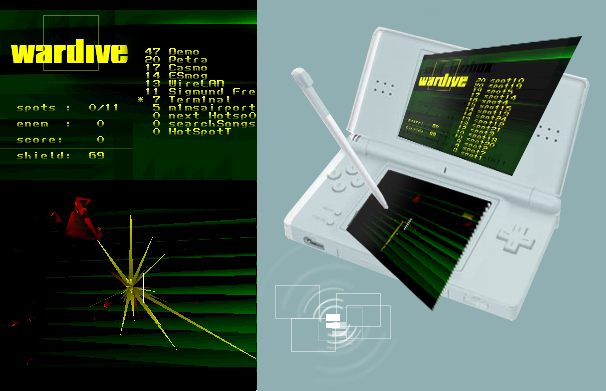 Then, maybe one day, my dream of a Wardriving version of Rez for the DS will become a reality.